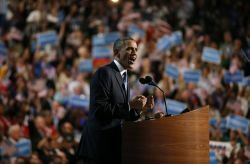 By Molly Moorhead on Friday, September 7th, 2012 at 10:54 a.m.
President Barack Obama speaks Thursday night at the Democratic National Convention in Charlotte, N.C.
On the final night of the Democratic National Convention, President Barack Obama was the big attraction. We checked several of his claims. "After a decade of decline, this country created over half a million manufacturing jobs in the last two and a half years," Obama said. We found that while the rise in manufacturing jobs he's referring to may be modest compared to the prior decade’s decline, he described the numbers carefully. We rated his statement True. He also said, "You can choose a future where we reduce our deficit without wrecking our middle class. Independent analysis shows that my plan would cut our deficits by $4 trillion." We found that the "independent" source that supports that claim is a liberal think tank. Another group, one that puts a premium on deficit reduction, gives the president credit for moving in the right direction but thinks he won’t get as far as he says he will. They think the president’s plan might get close to the $3 trillion mark, but not $4 trillion. We rated the statement Half True. Obama also said, "Now, I’ve cut taxes for those who need it – middle-class families and small businesses. But I don’t believe that another round of tax breaks for millionaires will bring good jobs to our shores, or pay down our deficit." We found that he has, but he also has raised some taxes. So while his statement was accurate, it lacked that additional context. We rated his claim Mostly True. Meanwhile, Obama said, "After all, you don't call Russia our No. 1 enemy -- not Al-Qaida, Russia -- unless you're still stuck in a Cold War mind warp," Obama said, alluding to Republican rival Mitt Romney." Romney didn’t use those exact words, but he did refer to Russia as "without question our No. 1 geopolitical foe." He said the Russians "fight for every cause for the world's worst actors" in a CNN interview. In a later interview, however, Romney softened his language, this time calling Russia our "No. 1 adversary" in terms of UN votes and emphasized it’s not an enemy of the kind launching missiles at American shores. That’s an important clarification, but it’s worth noting that five months passed before Romney walked back his earlier remarks. Obama’s statement lacked that context but was still largely accurate about Romney’s original description of Russia. We rate the statement Mostly True. The party also offered an array of warm-up acts before Obama's acceptance speech. Former Michigan Gov. Jennifer Granholm fired up the crowd with a boisterous account of Obama's efforts to save the U.S. auto industry. Vice President Joe Biden gave a personal account of his family and his work with Obama. And the Foo Fighters played "My Hero." We are fact-checking claims made by Obama and other speakers. Rep. James Clyburn, D-S.C., got a big reaction to his statement that when Social Security, Medicare and Medicaid were created, "Republicans stood on the sidelines." But we looked back on the creation of those programs and found that although there was GOP opposition at different points, all three were enacted with support from a majority of Republican. We rated Clyburn’s statement False. Former Florida Gov. Charlie Crist, who left the Republican party to make a run for U.S. Senate, talked about how the GOP has changed. "Jeb Bush recently noted, Reagan himself would have been too moderate, too reasonable for today's GOP," Crist said. We looked back at Bush’s quote when he said that the current partisan divide would make it difficult for Reagan to govern the way he did. But it’s unclear whether Bush said -- or suggested -- Reagan would be "too moderate" and "too reasonable for today's GOP." Our rating: Half True. Granholm repeated a popular Democratic talking point that Mitt Romney's response to the crisis in the auto industry was "Let Detroit go bankrupt." That, indeed, was the headline on an op-ed Romney wrote, but we found his message wasn't as dire as Democrats portray. We rated the claim Half True. We’ll be fact-checking speeches throughout the night and will update this story as we do.